From the time Forecast5 was established in New Zealand, half a billion NZ dollars’ worth of apples have been exported annually on the strength of it. Australasia’s largest vehicle distributor uses Forecast5, the Crusader and Hawke’s Bay Rugby teams and a large part of New Zealand’s wine industry use it, and in addition, Geof Nightingale has successfully launched the forecasting software in Australia. Last week Forecast5 exhibited at Europe’s largest accounting exhibition, Accountex 2016 – which welcomed over 6,000 visitors this year – to a favourable reception from the large crowds who stopped at the Forecast5 stand. “Progressing to the UK was a natural step, because this market loved WinForecast,” Nightingale said, shortly after arriving in London for Accountex 2016. 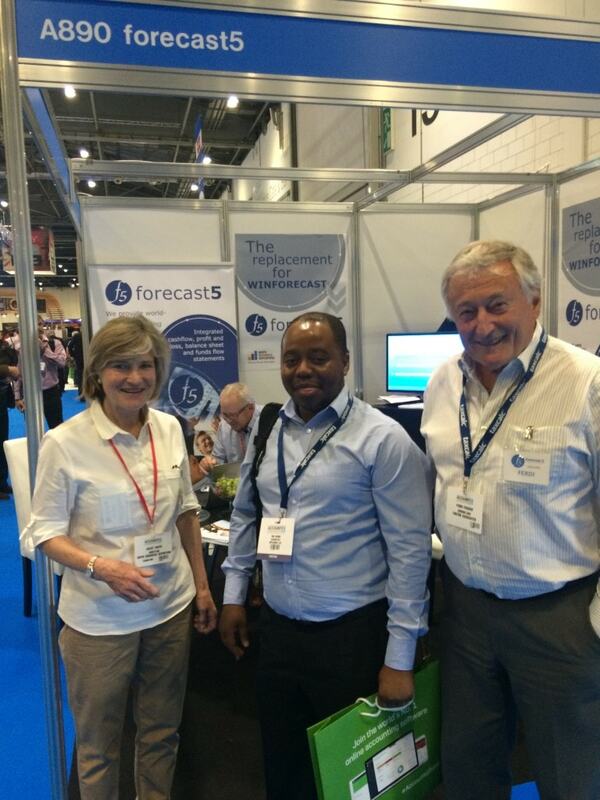 Fast, flexible, friendly, affordable – that’s how users describe Forecast5. Updated to incorporate UK requirements two months ago, it is popular with accountants and financial controllers who particularly appreciate the way Forecast5 produces integrated reports of cashflow, profit and loss, balance sheet and funds flow. Accountants are regularly asked to forecast the effect change will have on a business. What will happen if the UK Brexits? How will the strengthening dollar affect our American sales? Will IS attacks damage us—and by how much? What effect will losing our best designer have on our future? Forecast5 has been developed to replace Sage’s Winforecast; to model these and other forecasting scenarios accurately and fast. When one driver is changed, this translates through the entire program, with the impact on net profit, net cash, and the balance sheet automatically and immediately available. Previously, many financial directors used to rely on WinForecast to help them predict the future. Sage stopped selling this budgeting & forecasting program in 2012 and support for it ended in 2014, resulting in Winforecast falling over if attempting to run it on Windows 10 or Office 2016. Forecast5 is the successful result! Nightingale, a New Zealand chartered accountant, became involved in financial software straight out of university, “back in the days when computers operated with removable 10 megabyte disks”. He works hard at understanding what the end users need—and how to give it to them. “We’ve included a lot of small features to improve ease of use. Some seemed logical developments to me, others are the result of research with our clients. We are always open to new ideas and are constantly looking at ways to update and improve the program,” Nightingale said. WinForecast users can cut and paste their record list into Forecast5 in a very simple process to convert their Winforecasts into Forecast5. Two months ago, Forecast5 Version 3 was launched with the UK market in mind: it includes National Insurance codes, VAT, and PAYE that British accountants need. Those who purchase and settle before the end of May will be able to avail themselves of a 25% discount on the product price. Order forms for this Show – Month – Special can be downloaded here. “We’re just about ready to launch our Cloud version, using Microsoft Windows Azure which takes advantage of the new PAAS technology. This will give users the option of a web-enabled version, cloud deployment and monthly subscriptions” Nightingale said. “We are also evolving the product to integrate with Sage 50 (in beta now), Sage 300, Xero, Exact, Microsoft and other financial software solutions to create new forecasts and import monthly actuals. Currently any data can be imported from an Excel sheet into Forecast5, we are working on improving this process. After the Expo Nightingale and Forecast5’s UK distributor, Johnny Kipps of Kipps Business Reporting visited a number of clients and the ICAEW before Nightingale headed back to New Zealand – although after this very successful visit, he will be returning before the end of the year for the next exhibition! 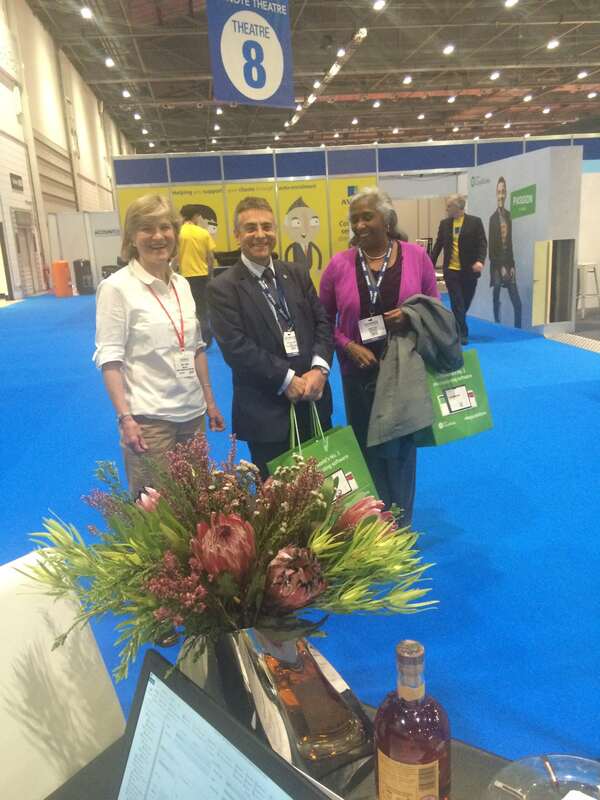 Our last visitors as the show started to wind down – you were all very welcome! Just before he returned to Auckland, Geof and Johnny conducted the draw for the lucky winner of the free copy of Forecast5 and a bottle of Monkey Shoulder triple malt whisky – which was won by Mrs Christine Hori of Horizontal Commercial Solutions. Well done, Christine! I hope you enjoy both your prizes! 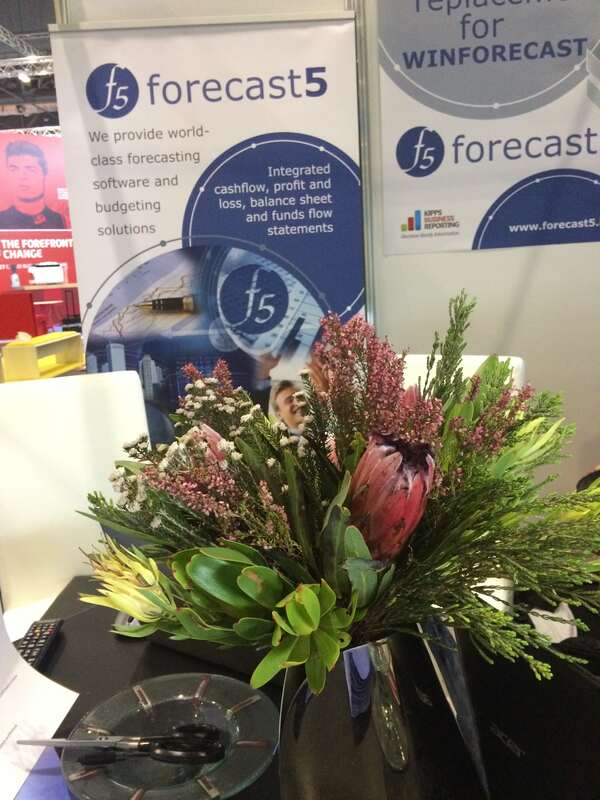 And the beautiful proteas which graced the Forecast5 stand – hand-carried from Kirstenbosch in the Cape – went to Kirsty McGregor of the Association of Crowdfunding Experts; Thanks Kirsty, well deserved!